Not that I am totally unaware of the continuous price drops in telecommunications, but the actual facts always surprises me. 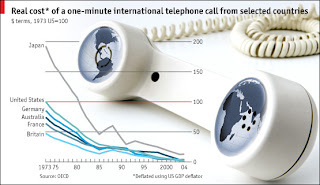 How amazing is this: When I was born, the real cost of a one-minute international phone call was roughly US$100! A one-minute phone call! $100. ONE minute. Read about it (The Economist).